Less than a month after the attack on Pearl Harbor, the U.S. Army formed its first air force designated to operate overseas, the Eighth. Within four months, they had set up base in England. Three months later, they were bombing German targets in occupied Europe. The Eighth was the first bomber command on either side to commit to strategic daylight bombing. It was a major change in tactics-and the men of the Eighth paid the price in both lives and blood. But it was that very sacrifice that led the Allies to victory. 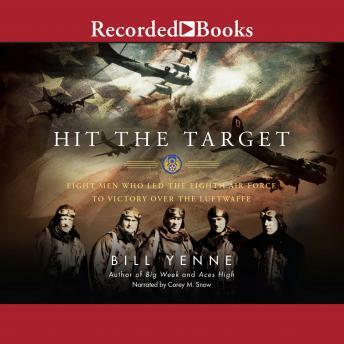 Hit the Target introduces readers to those who made the Eighth Air Force the formidable juggernaut it soon became. Men of all ranks, from General Tooey Spaatz, the hard-driving founding commander, to Colonel Jimmy Doolittle, the hero who led the first air raid on Japan, to Maynard "Snuffy" Smith, the irascible first airman in Europe to be awarded the Congressional Medal of Honor, and Robert "Rosie" Rosenthal, who survived his time with the "Bloody Hundredth," which lost airmen at a horrifying rate, and who went on to serve as a prosecutor at the Nuremberg Trials. The story of the Mighty Eighth is told through these men, whose careers paralleled the early history of aviation and who helped to revolutionize airborne warfare and win World War II.